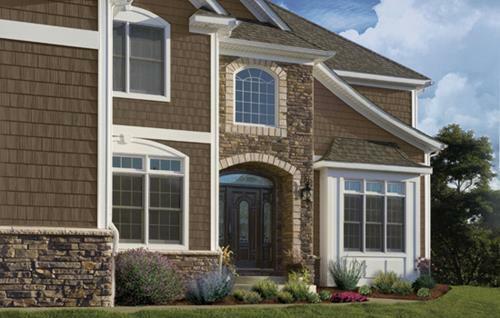 Shake and shingle siding is a distinctive style that confers a rustic, charming feeling to a house. If you are considering a siding job for your home, then you should be aware of all the styles and options at your disposal. Modern building techniques have made it possible for you to have a lot of options for siding a house, but, sometimes, a great number of choices can confuse people. In order to help you, we have created a list of the pros and cons of the shake and shingle siding so that you can decide if this particular style suits you. The first thing you should know is that shake and shingle comes in a variety of building materials. Whether it’s Hardiplank, engineered wood, vinyl or natural cedar, it’s up to you, depending on what you value the most. If you are environmentally conscious, then Hardiplank or engineered wood are the materials you want to use. They are made from woods fibers, cement and sand and, usually, the wood fibers come from recycled wood. If you want to save money and still get quality materials, then vinyl is what you should go for. If you value uniqueness and distinctive style, then cedar or another natural wood is the best material for your shake and shingle siding. The obvious advantage of using this siding style is that it creates a timeless, unique look for your house. If you are the creative type and you want to make a statement, you can also add brick or stone to make a masterpiece out of your house. This style is also versatile allowing you to create either a rustic look or an elegant, refined appearance for your house. Another benefit of shake and shingle style is that is very easy to repair. A disadvantage of this siding style is that it tends to crack, split and rot over time. But this can easily be overcome by using Hardiplank or vinyl instead of natural wood. Since Gut-R-Dun works only with premium suppliers, including James Hardie, we can accommodate your need for shake and shingle siding while using high-quality materials that are immune to rot, decay and other types of damage.